CPI’s Cable Runway and Tray Products provide simple and effective pathway solutions to easily manage and protect cables while maximizing network infrastructure uptime. With a variety of options and accessories available, CPI Cable Runway and Tray Products can be tailored to meet the specific requirements of each facility and are adaptable for future growth. Promote proper cable bend radii for better data transmission. Simplify moves, adds and changes. Meet ANSI/TIA/EIA installation guidelines for Category 5e/6/6a and fiber cables. Constructed of rectangular steel tubing for strength and support. 132 lb/ft maximum load with runway supported every five feet. Individually boxed to prevent scratching and damage. 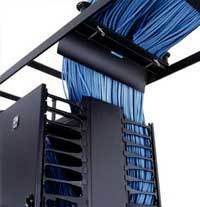 Wire Mesh Cable Tray Products provide point-to-point pathways for network cabling in data centers, network equipment rooms and office spaces. CPI offers OnTrac® Wire Mesh Cable Tray, a complete solution for indoor cable pathway applications. OnTrac creates point-to-point pathway for network cabling in data centers, network equipment rooms and office spaces. It installs quickly and can be cut to form smooth curved transitions around obstacles. Route cables under access floors or above acoustic ceilings to create hidden pathways for cables. Easy-to-use pathway solution that supports large quantities of network cables. Open top design makes cable moves, adds and changes easier. Available in multiple widths and depths to match cable fill requirements. Easy to splice and bond together. 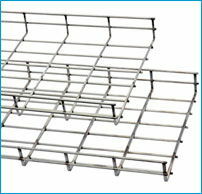 Support trays from the floor, ceiling, wall or the tops of racks and cabinets. UL Classified as an equipment ground conductor. Constructed from 5 mm and 6 mm diameter steel wires, welded on 2” x 4” (50 mm x 100 mm) intersections. Available in three heights 2” (50 mm), 4” (100 mm) and 6” (150 mm) and various widths in standard 10’L (3 m) sections. Pre-galvanized, black powder coat paint or zinc electroplate finish. Wide range of splices, clamps and brackets available. CPI provides a variety of products to reduce the risk of equipment damage from seismic events. 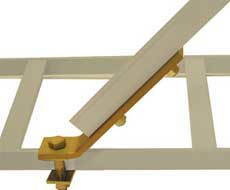 Stabilize and reinforce your cable runway with the below braces, brackets and kits. To create the ultimate cable pathway and runway solution, Chatsworth Products offers a wide variety of pathway and runway accessories. Whether working with network cables above drop ceilings or under access floors to cabinets and racks in data centers or equipment rooms, you need a flexible pathway for installations and existing obstacles. 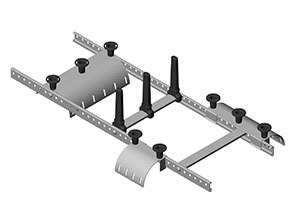 Accessories such as cable runway supports, splices, radius drops, runway bends, elevation kits and corner brackets join together to form a complete solution that ensures strong cable signal quality, reduces unnecessary clutter and confusing arrangements, and ultimately, streamlines your network for optimal use.